This week, my fellow #Moms4GMOs Kavin Senapathy and I published an article in Forbes magazine (every time I think of "Forbes magazine", I get that Bruno Mars song stuck in my head...). Our article was about how there are documented instances of foods losing their nutritional content when they obtain Non-GMO certification from the Non-GMO Project. There was a LOT we wanted to write, but we had to keep it short so we focused on baby formula. So in this post, I wanted to write a few more of my thoughts on this important topic. The nutritional fortification of our food is a big deal. Sometimes, food is enriched with nutrients that are lost during food processing, like when nutrients are added back to flour. Then there are foods that are fortified to provide more nutrients for health. Cereals are a good example. The enrichment and fortification of our food is of importance to public health. Micronutrient deficiencies are an issue in developing nations, as well as underprivileged segments of our population. As such, the World Health Organization has recognized the fortification of food with micronutrients as beneficial to public health because it can “deliver nutrients to large segments of the population without requiring radical changes in food consumption patterns.” (see this publication from WHO and this post from CDC for more info). Multivitamins. Image from Wikimedia Commons. 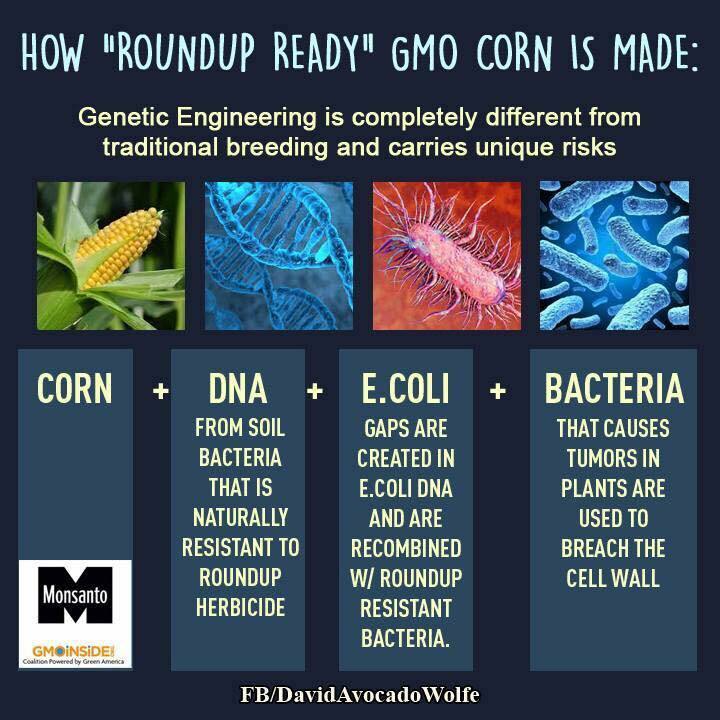 The idea that anti-GMO activists believe that this is a risk just blows my mind. Genetically modified corn is used as starting material to make a vitamin. In that process, it's fermented/processed. A pure vitamin is produced. A miniscule, yet nutritionally important amount of the vitamin is added to a food during it's processing (which is why it's a micronutrient). And somehow, people are concerned that Round-Up or some other contaminant made its way through all of that in sufficient quantities to pose a risk? No doubt there are detractors who argue that fortification and food enrichment does not address the issues that we’re facing with nutritional deficiencies in America; that we should strive towards diets with more fresh fruit, vegetables and whole grains as sources of vitamins and minerals. While I agree this is the ideal and should be our societal goal, we cannot simply reduce the enrichment of our food without having achieved it. The removal of these nutrients due to a marketing label that has no scientific basis puts at-risk individuals in our population in harm’s way. Several months ago, a paper was published about sweet potatoes being "natural GMOs". It got a lot of coverage in the press. I thought that it was high time that I read the original paper to see what it was all about. The paper is freely available in PNAS (Proceedings of the National Academy of Sciences. My mom freaked out the first time she heard me jokingly call the journal "pee-nass" after they rejected one of my papers during grad school). The paper starts by defining horizontal gene transfer. This naturally occurring process is when a gene goes from one species to another, and has been studied quite a bit in bacteria. Scientists are starting to identify instances of horizontal gene transfer in non-bacterial organisms: sometimes the gene that gets transferred ends up being non-functional, but sometimes it does. So horizontal gene transfer can also be important in the evolution of species. When anti-GMO activists claim that GMOs are not natural because scientists are taking a gene from one species and adding it to another, it is often pointed out that horizontal gene transfer happens "naturally" without any human intervention. To understand this point (and the importance of this paper), it is necessary to explain one of the more common methods that scientists use for transgenesis: Agrobacterium-mediated transformation. The summary below is from this freely available review (any additional references are indicated). The Agrobacterium genus has many different bacteria that cause different plant diseases. For genetic engineering, the species used is Agrobacterium tumefaciens which causes crown gall disease. Crown galls are growths on plants, similar to tumors. When the spouse read this, he pointed out that many of the gardening books that he's read highlight the fact that you're not supposed to use pruning shears on plants that have galls without cleaning them, so that you don't transfer the bacteria from one plant to another. Galls develop when a chunk of DNA from the bacteria, known as Ti-DNA (Tumor inducing) gets added to the plant's own DNA. For this to happen, the DNA needs to get cut out of the bacteria, transported into the plant cell, and integrated into the plant's genome. This process is carried out by proteins that are made by the bacteria known as vir genes (virulence), and there's quite a few of them that perform different tasks in the transformation process. The vir genes get activated by sensing compounds that are released when a plant is injured. Think of the injury as an alarm bell that suddenly alerts the Agrobacterium to the fact that infection is now possible. Once the vir proteins are active, they process the bacterial DNA that will be transported into the plant cell. This DNA is flanked on both sides by a very short segment of DNA that acts as a recognition site for vir proteins which then cut the DNA. Think of the short DNA segments as neon lights flashing "CUT HERE". Once the vir proteins cut the DNA, it is transported by proteins across a channel in the plant's cell wall. In this process, different vir proteins transport the DNA, protect the DNA from getting degraded, and also form the channel to get the DNA into the plant cell, so there are many players in this process. Once it's in the plant cell's nucleus, the bacterial DNA gets integrated with the plant DNA, and several mechanisms have been proposed as to how this may happen. Once the DNA gets integrated, it can activate gall-causing proteins using the plant's own cellular machinery. The DNA that gets transferred from the bacterium to the plant is known as T-DNA (Transfer-DNA. Remember this one, because the abbreviation will be used in the paper). A fear inducing meme, made by GMO Inside! Rebranded by David Avocado Wolfe. In genetic engineering, the Agrobacterium has been engineered such that the bacteria no longer causes tumors. Additionally, the T-DNA consists of the gene that scientists want to transfer into the plant, such as the gene that confers Round-Up resistance, or a gene that may confer drought resistance. Many anti-GMO websites will use emotional phrases such as "GMOs use bacteria that cause cancer in plants" (see the image from GMO Inside! that I've shared here). Although the statement is correct, it's a half truth because the bacteria has been engineered to no longer cause tumors in plants. So the intent is to evoke fear by combining scary or emotional phrases and terms. So now we'll get back to the paper. The paper outlines that the sweet potato is "one of the oldest domesticated crops in the Americas". Archeological studies have found it in caves dating back as far as 8,000-10,000 years. There are 13 known species and 2 naturally occurring hybrids. The authors explain that in a previous study that was studying short RNA molecules in sweet potato, they had found RNA molecules that were similar to Agrobacterium, so they decided to investigate this further by looking for Agrobacterium T-DNA sequences in the genome of the sweet potato. First, they took the snippets that they had identified in their first study and confirmed that they were real using a different technology. This is important, because it highlights that their findings weren't due to contamination or some issue related to the methodology they chose. Once this had been confirmed, they went on to identify the entire T-DNA sequence in the sweet potato genome. They found two large regions of Agrobacterium rhizogenes DNA: this bacteria is from the Agrobacterium family and it creates galls in plant roots. The two regions of Agrobacterium DNA that they identified in the sweet potato genome contained the code for potentially 9 different proteins. Again, these findings were confirmed using a different technique. They found that one of these large DNA segments had gotten inserted into the sweet potato genome at a site where there was a gene, thereby interrupting the gene. They found evidence suggesting that the gene that was interrupted was active before the large DNA segment interrupted it. The authors went on to determine if the genes in the large DNA segments that were inserted into the sweet potato were turned on. They did this by checking to see if the inserted DNA had been transcribed into RNA. Sure enough, the inserted genes were turned on; not at very high levels but still detectable in most tissues. The authors decided to check to see if the genes that had been inserted into the sweet potato they were studying were also present in other sweet potato varieties. They selected a wide variety of plants from different continents. They found that one of the large DNA segments was present in nearly every domesticated sweet potato plant examined, but wasn't present in wild sweet potatoes. The second large DNA segment wasn't present in every sweet potato variety. The authors hypothesize that the widespread presence of one of the large DNA segment in domesticated sweet potatoes suggests that it caused a trait that we selected for. The paper concludes with this paragraph "Agrobacterium-mediated transformation has been the method of choice for the development of genetically modified crops. Despite their cultivation on more than 170 million ha, the growth and consumption of transgenic crops still faces societal opposition. This has impeded their use in efforts to contribute to a more sustainable agricultural future. Our data reveal that T-DNA integration, the interruption of an F-box gene, and the subsequent fixation of foreign T-DNA into the sweet potato genome occurred during the evolution and domestication of this crop, which is one of the world’s most consumed foods. This finding could influence the public’s current perception that transgenic crops are “unnatural.” "
I think it's important to highlight the key features of the paper, with respect to genetic engineering (the points below are my thoughts and summary). -Thousands of years ago, a bacteria closely related to the bacteria used to create GMOs, inserted a bunch of genes into the sweet potato. The GMOs on the market add fewer genes than what was naturally introduced into the sweet potato. -The introduction of these genes into the sweet potato generated an "unintended consequence": namely, that a sweet potato gene was interrupted. Sweet Potato Cakes that are "GMO-Free"
-The fact that these changes are present in domesticated sweet potatoes and not wild sweet potatoes points to the strong possibility that they were selected by artificial selection. In natural selection, it's the survival of the fittest where the genes that give reproductive and survival advantages usually win. So a mutant plant that creates a more toxic substance may propagate its genes because fewer predators will eat it. In artificial selection, it's the genes that are most convenient for humans that win out, and we see it most commonly in agriculture and animal breeding. That means that we might select for genes that create cuddly dogs. Or we might select for genes that give rise to sweeter fruit. But that does not mean that the Chihuahuas that we've created and the oranges that we've bred are the strongest to survive out in the wild. If the genes examined in this paper did in fact give the sweet potato selective advantage out in the wild, then odds are that the wild sweet potatoes would have the gene, too. So this point, that we humans selected for a mutant that arose through transgenesis, defies the anti-GMO argument that nature has created what is naturally best over the course of evolution. The incredible irony is that what we selected for was transgenic in origin. -I think the example of the sweet potato can make the legal definition of the term "GMO" more difficult. If it's defined as a crop where genes have been added by Agrobacterium, then should the sweet potato be excluded? -This is a great example for individuals who think that genes from viruses or bacteria in crops are "unnatural" (or what I call "The Ick Factor"). 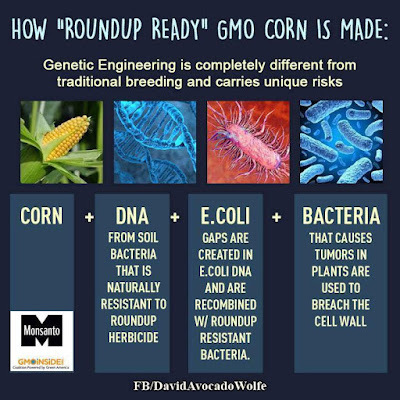 In conclusion, I usually don't use the argument that "everything we eat is a GMO". But, in the case of the sweet potato, the genes added arose by Agrobacterium-mediated transgenesis, which is a method used in modern-day genetic engineering. So next time you're shopping, you'll know that the "Organic, GMO-Free, Sweet Potato Cakes" that are for sale at Costco have bacterial DNA and proteins in them.